When the Ducks begin spring practices on March 31st, most of the attention will be on the quarterbacks. While Vernon Adams will still be finishing his degree at Eastern Washington, five other Ducks quarterbacks will be jockeying for position to beat out Adams in the fall, and the national media will be watching closely. All the focus on the quarterback position is warranted, given it is undoubtedly the most important position in college football and Oregon is replacing Marcus Mariota, the best player in program history. However, Oregon should be just fine at the quarterback position; there should probably be more concern with what strides Oregon’s defense can make this spring and offseason. 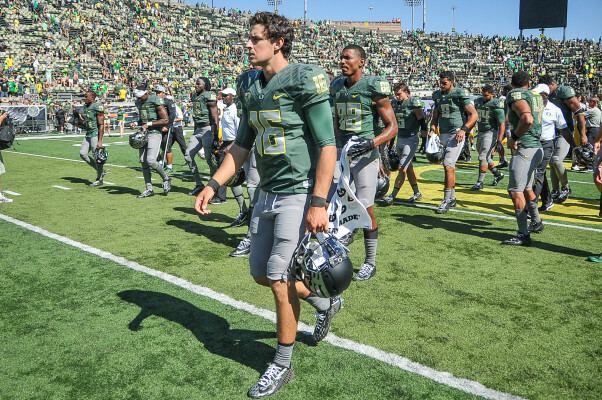 Redshirt Freshman Morgan Mahalak is seeking to replace Marcus Mariota as Oregon’s starter. The first thing Ducks fans will have to accept is that whoever ends up starting as quarterback next season will not be Marcus Mariota. No Duck has ever been as good as Marcus. Very few Ducks quarterbacks in the last 20 years have been close to being in the same realm as Mariota. Dennis Dixon was exceptional during the 2007 season until he got hurt, and Joey Harrington was outstanding in 2001 when he finished fourth in the Heisman, but even those seasons fall short of what Mariota has done. The next Oregon quarterback could be great and could potentially build his own legacy but, Ducks fans don’t do him or the team any favors by putting added pressure on him to be Marcus. Oregon football without Marcus will go on, and Oregon’s offense will be just fine. Oregon’s offense had incredible success before Marcus was a Duck and should find success again next year. Outside of the quarterback struggles for portions of the 2003 and 2008 seasons, Oregon has had good to great quarterback play for the past 15 years, even as the Ducks have transitioned between quarterbacks. In addition to Marcus, Oregon is fortunate to have had many other outstanding signal callers including Joey Harrington (3rd overall pick in the NFL Draft), Kellen Clemens (still in the NFL), Dennis Dixon (was on track to win the Heisman in 2007 before an injury), Jeremiah Masoli (led the Ducks to the Rose Bowl), and Darron Thomas (led the Ducks to the national title game). Since Oregon made the switch to its current offensive system in 2007 when Chip Kelly arrived as offensive coordinator, Oregon has had especially consistent quarterback play. Coaches Chip Kelly, Mark Helfrich, and Scott Frost have found a way to develop a strong quarterback on their roster every year. They have taken two somewhat highly recruited players, four-star talents Dennis Dixon and Darron Thomas, and turned them into winning quarterbacks. Additionally, they have taken two under-the-radar recruits in Jeremiah Masoli and Marcus Mariota and produced strong quarterback play. Oregon has ranked in the top 11 in points per game every year since 2007 largely due to the effective play of Oregon quarterbacks. Oregon’s reputation for exceptional offense predates Mariota as quarterback. Oregon ranked number one and number three in the nation in scoring in the two seasons before Mariota was the starter. This year, Coach Helfrich and Coach Frost have an intriguing mix of quarterback talent to work with. The past two Oregon quarterback battles had supposed favorites (Nate Costa and Bryan Bennett) unexpectedly lose the starting job to the less experienced Thomas and Mariota. There is much speculation, but no one really knows who of the six candidates will emerge this fall as Oregon’s starting quarterback. 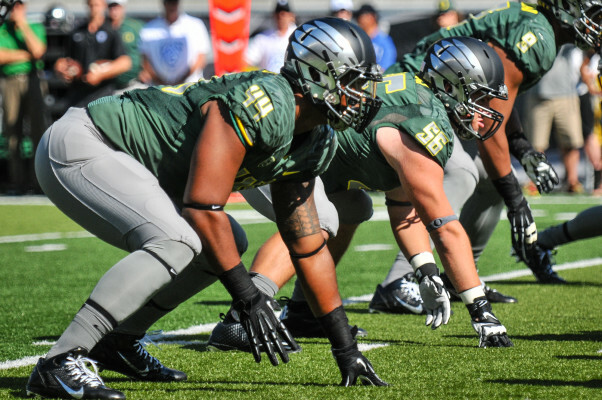 Returning All Pac-12 Defensive End DeForest Buckner will look to help Oregon’s defense improve in 2015. These six potential starters provide an interesting combination of talent — former four-star recruits in Morgan Mahalak and Travis Waller, and two little-known guys who were the only Ducks quarterbacks (other than Mariota) to see the field last year in Jeff Lockie and Taylor Alie. Additionally, Vernon Adams, who spent the last three years dominating the FCS, will be on campus competing in the fall. Lastly, Ty Griffin, a former option quarterback at Georgia Tech has been heralded as the fastest of the Oregon quarterbacks and might also have the strongest arm of any in the group. Whomever wins the starting quarterback position will have their transition made considerably easier by the embarrassment of experienced skill position talent that will be surrounding them next fall. Many top-tier college football teams have numerous talented, highly recruited skill position players, but few teams have more than a couple players who have proven their talent in college. Oregon has at least nine talented, highly-recruited skill position players who have already proven their ability on the biggest stages of college football (Royce Freeman, Thomas Tyner, Byron Marshall, Bralon Addison, Darren Carrington, Devon Allen, Dwayne Stanford, Charles Nelson and Pharaoh Brown). Mark Helfrich and Scott Frost have proven to be great quarterback coaches (e.g., Marcus Mariota’s development from three-star recruit to Heisman trophy winner). They will be able to take the six talented quarterbacks on campus and, at minimum, produce one effective game manager who can get the ball to arguably the deepest group of skill position players in the country. 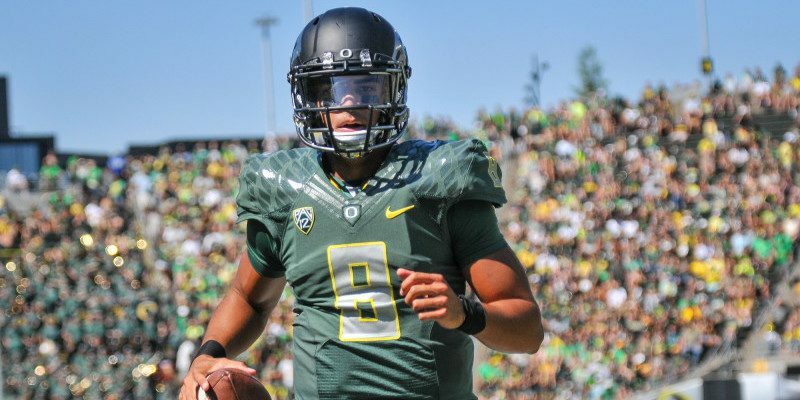 The Oregon offense will not be the same without Mariota, but it will keep humming. The bigger question that will determine Oregon’s ability to remain a top team next year is whether Oregon’s defense can improve. Having a once-in-a-generation player like Marcus Mariota helped cover up for some inconsistent defense last year, but with Mariota gone, it is even more important that the defense improve. After ranking outside the top 50 in yards per play on defense in 2014 (Oregon was number seven in 2013. ), and getting dominated by Ohio State in the National Championship Game, the pressure is on the defense. Whether Don Pellum in his second year as defensive coordinator can help Oregon’s defense take the necessary strides this spring and offseason will determine what kind of success Oregon will have next year. Combining a stronger defense with solid quarterback play and a powerful offense should keep Ducks fans excited, once again, in 2015.